Digital UltraViolet and Digital Copy will makes it possible for you to stream the movie Alpha UV or iTunes Code instantly to your computer and compatible Smartphones, Andriod, iphone, iPod Touch, iPad and tablets devices anytime, anywhere. 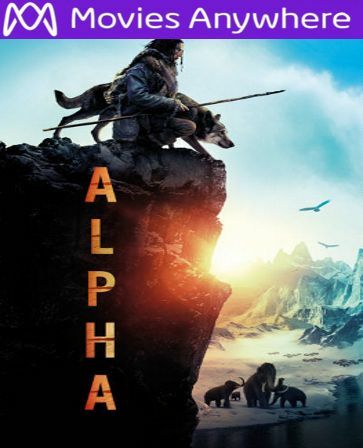 You can also download a Digital UltraViolet Copy or a Digital Copy of the movie Alpha UV or iTunes Code to your computer and compatible devices. There�s a visual purity about the new movie �Alpha� which isn�t seen much in motion pictures since Stanley Kubrick departed the scene in 1999. The movie looks almost as if it was produced in an airless and sterile environment, despite the characters� sometimes smearing themselves with mud, paint, or another semi-solid liquid in preparation for a hunt or a ceremony. During its opening scenes �Alpha� resembles nothing so much as the first twenty minutes of Kubrick�s �2001: A Space Odyssey,� depicting the Dawn of Man. Set 20,000 years ago during the Ice Age, in �Alpha� young Keda, the adolescent son of the tribal leader Tau, is badly mauled and ravaged by a marauding bison during his first hunt. Thrown over an impossibly steep cliff by the rampaging beast and landing on a narrow ledge, the boy is presumed dead by the other hunters and deserted by the tribe. But after a few days, Keda regains consciousness, and sets about the business of survival. While defending himself against a roaming wolfpack a few days later, Keda badly injures one of the attacking animals. And in their mutual quest for survival, the boy and the wolf form a bond and begin to instinctively aid and protect each other in both recovery and endurance as they begin an odyssey together back to Keda�s tribe. Directed by Albert Hughes, one-half of the Hughes Brothers filmmaking team responsible for movies as diverse as �Menace II Society,� �From Hell,� and �The Book of Eli,� �Alpha� combines an elemental A Boy and His Dog story with 1971�s �Man in the Wilderness� and produces a beautifully-realized and deeply moving mini-epic. The magnificent cinematic storytelling in �Alpha� is augmented by Martin Gschlacht�s breathtaking photography of remote earthly vistas, displayed with a clarity reminiscent of science fiction and making the British Columbia and Alberta filming locations seem otherworldly instead of earthbound. This is the rare picture which might be enhanced in a theater equipped with high definition and 3D�Cinerama is no longer available. Kodi Smit-McPhee contributes to �Alpha� a wonderfully evocative performance in a difficult role. Smit-McPhee is a terrific young Australian actor who despite his appearances as the character Night crawler in the Marvel comics pictures hasn�t received much of an opportunity for film acting since his stunning performance as a lonely, bullied schoolboy befriended by a girl with unique abilities in the often-overlooked 2010 horror masterpiece �Let Me In.� As young Keda, the actor�s open and infinitely expressive face communicates clearly every nuance of the boy�s hopes and fears, his insecurities and loneliness, his hunger and cold. Keda�s bonding with the wolf, whom he names Alpha�actually a Czechoslovakian Wolfdog identified in the closing credits as Charlie�is both eminently believable and warmly touching. When toward the end of the picture, Keda communicates to the wolf in the colloquial language of his tribe the subtitled sentiment �You are my tribe,� you might be surprised to find yourself wiping away a tear. �Alpha� will be a movie for your video library. �Alpha� has attracted some controversy over its failure to earn the customary disclaimer that �no animals were harmed during the making of this picture.� Reportedly four Canadian bison were killed during the picture�s production for a scene depicting the removal of hides after a hunt. Allegedly the bison were already marked for slaughter, and were harvested in a humane manner by experts from Canada�s Long view Beef Jerky Company. The picture is receiving respectable notices from critics, including an approval rating of 84% from Rotten Tomatoes, based on 55 reviews, and an average score of 62% from the less-enthusiastic Meta critic. Exit audiences polled by Cinema Score assigned �Alpha� an average grade of�well, Beta-plus. Playing in 2719 theaters across North America, distributor Columbia Pictures hoped to earn $8 million during the picture�s opening weekend.